– Ring Mag #2 & WBA Straweight Champion Knockout CP Freshmart aka Thammanoon Niyomtrong stopped unrated Go Odaira at 1:07 of the 5th rd on March 1st in Chonburi, Thailand. Freshmart scored a knockdown in the 4th rd and ended matters with a left uppercut-right hand combination. This was Freshmart’s 2nd defense of his title and his first stoppage in four fights. Odaira has now lost 3 of 5, all by knockout and all in World Title bouts. – Ring Mag & WBC Bantamweight world Champion and Ring Mag #9 pound for pound, Shinsuke Yamanaka stopped unrated Carlos Carlson at :57 of the 7th round on March 2nd at Kokugikan in Tokyo, Japan. Yamanaka scored 5 knockdowns, 2 in the 5th round, 1 in the 6th round & 2 in the 7th. It was his 12th defense of his WBC title & 1st of his Ring Mag belt. Carlson had his 22 fight win streak snapped. – Ring Mag #7 rated heavyweight David Haye was stopped at 2:16 of the 11th round by Ring Mag #3 & WBC cruiserweight champion Tony Bellew on March 4th at the 02 Arena in Greenwich, London. Haye ruptured his Achilles in the 6th round, while Bellew broke his right hand early on. Haye was dropped in the 6th round and then again in the 11th, going through the ropes and after rising his corner threw in the towel. Bellew was a 7:1 ‘dog. He has now stopped 5 of his last 6 foes including 3 straight. 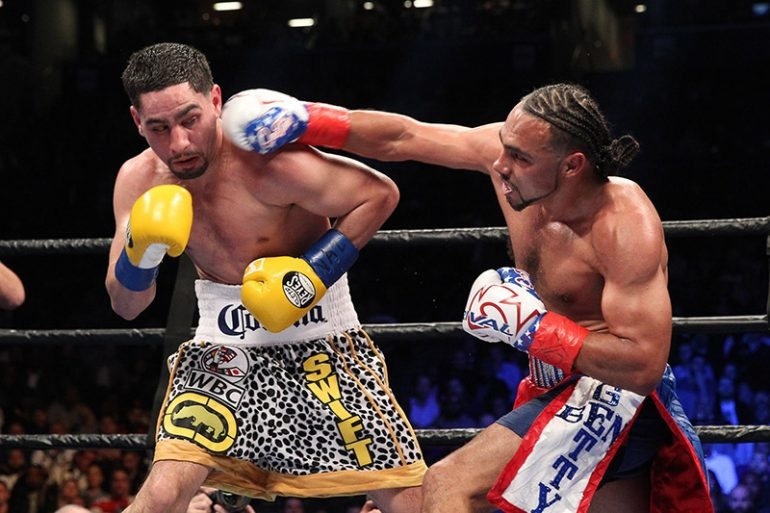 – In a unification battle of top 10 welterweights, Ring Mag #2 & WBA champ Keith Thurman won a 12 rd split decision against Ring Mag #7 & WBC Champ Danny Garcia by the scores of 116-112, 115-113 & 113-115 on March 4th at the Barclays Center in Brooklyn, NY. Thurman rocked Garcia in the 1st round and won the early rounds, with Garcia being the aggressor and winning the later rounds. It was a close but clear win for Thurman, who was making the 3rd defense of his title. Four of his last 5 contests have gone the distance. This was the 1st welterweight unification fight between undefeated fighters since 1999 when Felix Trinidad defeated Oscar De La Hoya. The event was the largest grossing non-NBA sporting event in Barclays Center history, while also setting the venue record for boxing attendance at 16,533. – On the undercard of Thurman/Garcia, Ring Mag #9 Jr Welterweight Sergey Lipinets stopped unrated Clarence Booth at 1:33 of the 7th round in a tune up bout as he is next in line to meet the winner of Ricky Burns/Julius Indongo for the IBF & WBA Titles. – Unrated Flyweight Juan Hernandez stopped Ring Mag #7 Nawaphon Por Chokchai aka Nawaphon Kaikanha at 2:29 of the 3rd round on March 4th at National Stadium Gymnasium in Bangkok, Thailand for the vacant WBC Title. Por Chokchai rose from a 3rd round knockdown, but Hernandez’s follow up was too much to withstand and referee Tom Taylor stopped the contest. Hernandez has now stopped 8 of his last 9 foes including 6 straight. He hasn’t lost since 2011 against current Ring Mag #1 Flyweight Kazuto Ioka for the WBC Straweight title. 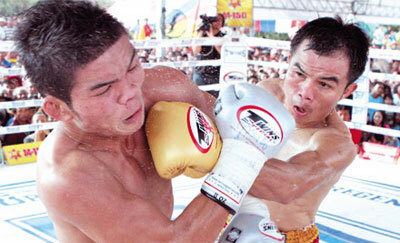 Por Chokchai saw his undefeated record come to an end after 36 wins to begin his career. – Ring Mag #4 Featherweight & IBF Champion Lee Selby stopped unrated Andoni Gago in the 9th round on March 4th at the 02 Arena in Greenwich, London, UK. The fight was a non-title affair and Gago was down in the 1st round before the stoppage. 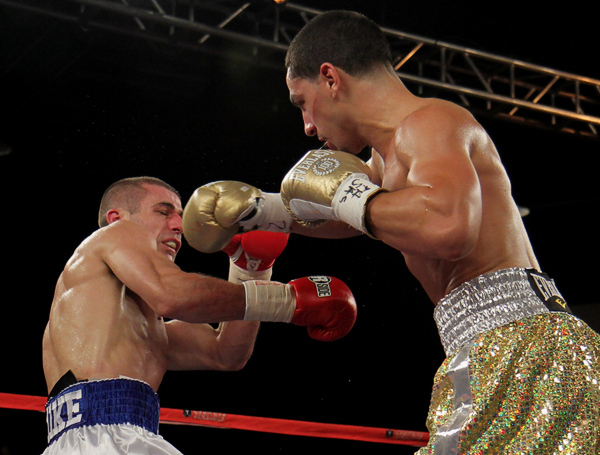 This was Selby’s 1st stoppage s/2014, a span of 3 fights and the last time he wasn’t in a World Title bout. – 3/6 Paulie Malignaggi, the former IBF Jr Welterweight & WBA Welterweight World Champion announced his retirement. – 3/8 Hall of Fame trainer & manager Lou Duva passed away at age 94. He guided the careers of 19 World Champions. – Ring Mag #8 bantaweight Tomoki Kameda won a 10 rd UD over unrated Pipat Chaiporn by the scores of 100-88, 100-90 & 99-90 on March 10th at Korakuen Hall in Tokyo, Japan. Kameda scored a knockdown in the 6th round and controlled the action. Kameda weighed in at 123.25 pounds for the fight and its odd that he’s still in the Ring Mag Ratings at bantamweight as he hasn’t made the division weight limit since 2015. Update: Kameda was dropped from the ratings the week following this fight. – Ring mag #4 middleweight David Lemieux stopped unrated Curtis Stevens at 1:59 of the 3rd round on March 11th at the Turning Stone Resort Casino in Verona, New York on HBO’s Boxing After Dark. A left hook knocked Stevens out cold and he left the ring on a stretcher. Lemieux has now won 12 of 13 including 3 straight since his 8th rd TKO loss to GGG in Oct ’15. Of his last 12 wins, 9 have now been finished inside the distance. With the vacant WBO Inter-continental title being awarded, Lemieux could be in line for a shot at Ring Mag #3 & WBO Champ Billy Joe Saunders in the near future. – Ring Mag #5 Jr Middleweight Demetrious Andrade won a 12 rd SD over unrated Jack Culcay by the scores of 116-112 twice & 113-115 on March 11th at Friedrich-Ebert-Halle in Ludwigshafen, Germany. There were no knockdowns and Andrade was in control throughout. The fight was for the ‘regular” WBA title as the true WBA World Champion is Ring Mag #2 Erislandy Lara. Andrade had his 3 fight KO streak stopped. – Ring Mag #7 Lightweight Richard Commey won a 12 rd UD over unrated Hedi Slimani by the scores of 116-113, 116-111 & 117-111 on March 11th at the Bukom Boxing Arena in Accra, Ghana. Commey was cut above his left eye in the 6th rd and Simani was cut below his left eye in the 7th rd. With the win Commey snapped his string of B2B split decision losses, each to current Top 10 ranked Lightweights, thus maintaining his status in the division. Slimani had his 18 fight win streak snapped. – Ring Mag #5 Jr Bantamweight Juan Fracisco Estrada stopped unrated Anuar Salas at 2:01 of the 5th round on March 11th at Arena Ciudad de Mexico in Mexico City, Mexico. Estrada used a body attack to wear down Salas, dropping him twice. This was Estrada’s 2nd fight since moving up in weight and vacating his WBA & WBO Flyweight titles. – On the undercard of Estrada/Salas, Ring mag #10 rated Bantamweight Luis Nery stopped unrated Jesus Martinez when Martinez failed to come out for the 5th round. Nery has now stopped 8 of his last 9 foes, including 4 straight. With the win he is now the mandatory contender for WBC & Ring Mag Champ Shinsuke Yamanaka. – 3/15 Former Ring, Mag, WBC & WBA Middleweight champion Rodrigo “Rocky” Valdes passed away at age 70 after a massive heart attack. His career record was 63-8-2, with 43 knockouts. He beat hall of famer Bennie Briscoe in all 3 of their matches including stopping him in their 2nd fight. – Ring Mag #8 Cruiserweight Firat Arslan stopped unrated Gezim Tahiri after 2 rounds on March 17th in Istanbul, Turkey. Tahiri couldn’t continue due to a shoulder injury. Arslan has now won 6 of 7 including 5 straight. – In a battle of Top 5 Middleweights, Ring Mag #4 Pound for Pound, #2 Middleweight, IBF, WBC & WBA Champion Gennady “GGG” Golovkin won a hard fought, closer than expected 12 round UD over #2 Danny Jacobs by the scores of 115-112 twice & 114-113 on March 17th at Madison Square Garden in Manhattan, New York. GGG scored a knockdown in the 4th round, but couldn’t finish Jacobs off and went the distance for the 1st time since 2008, ending a 23 fight knockout streak. Jacobs showed a ton of heart and landed plenty of hard shots as well. GGG was making the 7th defense of the WBA title, 3rd IBF defense & 2nd WBC defense. 19,939 (including me!) in attendance. 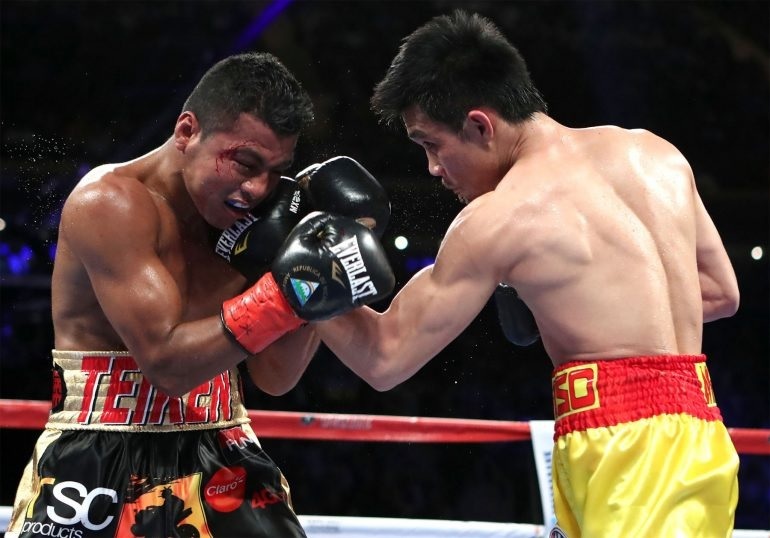 – On the undercard of GGG/Jacobs in a battle of Top 10 Jr Bantamweights, Ring Mag #1 lb for lb, #2 Jr Bantamweight & WBC champ Roman Gonzalez, making the 1st defense of his title, shockingly lost a controversial 12 rd majority decision against Ring Mag #4 Srisaket Sor Rungvisai aka Wisaksil Wangek by the scores of 114-112 twice & 113-113. Gonzalez was dropped in the 1st round from a body shot and suffered two nasty cuts, one over his right eye & another on the right side of his head due to headbutts. Rungvisai was deducted a point in the 6th round for the headbutts after several warnings in the preceding rounds. Gonzalez appeared to control the middle rounds, but there was steady two way action throughout in the action packed contest. Gonzalez had a huge 12th round as Rungvisai backpedaled nearly the entire stanza. The crowd heavily booed the decision & the ringside media had the bout in favor of Gonzalez, whose face was a crimson mask at the conclusion. Rungvisai was a 14:1 underdog as his last 7 opponents had either DD losses or less than 4 wins. Gonzalez was the former Strawweight, Jr Flyweight & Flyweight champion. His last 3 fights have gone the distance after having his prior 10 end inside the distance. A rematch is definitely in order. FOY candidate! – Also on the undercard of GGG/Jacobs, Ring Mag #3 Jr Bantamweight Carlos Cuadras won a 10 rd UD over unrated David Carmona by the scores of 97-93 twice & 96-94. Both were cut during the bout (Cuadras over left eye). Cuadras built an early lead, while Carmona appeared to come on late. Cuadras was coming off his 1st career loss when he lost his WBC Title to pound for pound #1 Roman Gonzalez last Sept by 12 rd UD. – Also on the undercard of GGG/Jacobs, Ring Mag #5 Middleweight Andy Lee won an 8 rd UD over unrated KeAndrae Leatherwood by the scores of 80-72, 79-73, & 78-74. Lee was coming off a 15 month lay off and was rusty as expected. It was his 1st win since 2014. – 3/20 The 11th Judicial Circuit Court Judge Migna Sanchez-Llorens upheld the $8.5M winning lawsuit filed by All-Star Boxing against Ring Mag Middleweight Champion Canelo Alvarez for unjust enrichment. – 3/21 Andre Ward moves up to #1 in the mythical Ring Magazine Pound for Pound rankings, overtaking Roman Gonzalez, who fell to #4. – Ring Mag #10 & WBA Super Middleweight titlist Tyron Zeuge made his 1st successful title defense with a 5th round technical decision over unnrated Isaac Ekpo by the scores of 49-46, 48-47, & 49-47 at the MBS Arena in Potsdam, Brandenburg Germany on March 25th. Zeuge was cut over his right eye in the 3rd round from a clash of heads and the fight was stopped after the 5th due to the cut. – Ring Mag & WBA lightweight champ Jorge Linares successfully defended his titles for the 1st time by 12 rd UD in an immediate rematch with Ring Mag #4 Anthony Crolla with all 3 judges turning in identical 118-109 scorecards on March 25th at the Manchester Arena, Lancashire, UK. Linares scored a knockdown in the 7th round from a right uppercut and appeared to be close to scoring a stoppage. Crolla was game and grew more aggressive as the fight carried on, but there was not close to the amount of drama surrounding their 1st fight, which was a 2015 FOY candidate. – Ring Mag #1 Straweight & WBC champ Wanheng Menayothin aka Chayaphon Moonsri won a 6 rd UD over Jaysever Abcede in a non-title bout on March 31st at Com Thong District in Bangkok, Thailand. Menayothing was in control throughout and cruised to an easy win against the overmatched Abcede. Menayothin has now gone the distance in 4 straight fights. – Former 3X Super Middleweight Champion Mikkel Kessler announced he will be coming out of retirement and return to the ring later this year. Kessler hasn’t fought since a 12 rd UD loss to Carl Froch in May ’13. Kessler just turned 38 years old on March 1st.